Quick review of Battle Cash Bonanza. 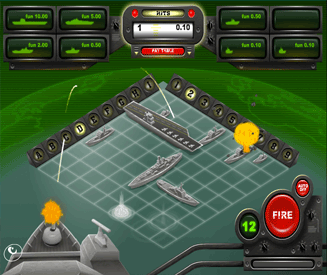 Battle Cash Bonanza is the closest you’re going to get to playing Battleships online for money. In fact, I don’t know why the creators of Battle Cash Bonanza didn’t just go ahead and call this game "Battleship" in the first place. There must be a pesky trademark flying around. Anyway, Battle Cash Bonanza shows you the game board with all the different ships and stuff on it (clearly I was never in the Navy). Your objective is to fire a cannon and hit as many of the ships as possible. The more ships you hit and the more ships you sink, the more money you will win. So it’s not quite the game of Battleships you’re used to when playing with your friends on "toy day" in school, but it’s close enough to bring back some warm memories. Note: If you’re interested in a more keno-like Battleship-style game, check out Nelson’s Victory. Battle Cash Bonanza fun rating - 70%. I don’t believe that there is actually any skill involved when it comes to firing the cannon at the ships. My friend is adamant that there is because the cannonballs do tend to be fired in the general direction of the oscillating cannon, but I’m skeptical. Prove my friend wrong for me will you? Now aside from a potential skill factor, Battle Cash Bonanza is an overall fun game. Shooting a cannon, blowing up ships and winning money at the same time is immensely satisfying. It’s also exciting to watch a cannonball hurtling toward a target and knowing that a "cha-ching" sound is just around the corner. So with all this fun and excitement, why isn’t the fun rating higher? Well, I’ve played Battle Cash Bonanza a bunch of times, and the winnings seem to be "limited". Before every game I always get the feeling that I’m either going to lose a small amount the vast majority of the time or occasionally win a small amount. Sure, the potential to win big is there, but it’s not convincing enough to tempt me in to playing Battleships online for money over and over again. Maybe I’ve just been unlucky. How to play Battle Cash Bonanza. The basics of Battle Cash Bonanza. Unfortunately you don’t get to place each individual boat yourself. You do have the option to change the board to other random combinations, but we both know that’s just not the same. Battle Cash Bonanza in more detail. The are 8 different ships spaced out across a 9x9 grid. You have 20 cannonballs to fire in to the grid (or the sea, whatever you want to call it). Every time you hit a ship, your winnings increase. You get bonuses for every ship you sink. That’s pretty much the long and short of it to be honest. Your 20 cannonballs can be fired either manually or automatically. If you choose "auto" they will be fired at a fairly fast rate, increasing the speed of the game. After the final cannonball has been fired the game is over. Each time you hit a ship, you winnings accumulator increases. If you achieve a handful of hits your winnings will be relatively small. However, if you manage to get 10 or more hits out of 20 you stand to win a fairly sizeable amount of money (between 10x and 10,000x your initial stake). Fact: Out of the 81 squares on the grid, 20 squares are covered by ships. A cannonball that hits a ship in the same place twice also counts toward the accumulator. Different ships have different lengths. The smallest ships are 1 square in length whereas the longest (the battleship) is 5 squares in length. The longer the ship is, the more it is worth if you can manage to sink it. To sink a ship you must hit every section of it at least once with a cannonball. Simply hitting a ship with a cannonball (the accumulator). Sinking a ship is classed as a bonus. 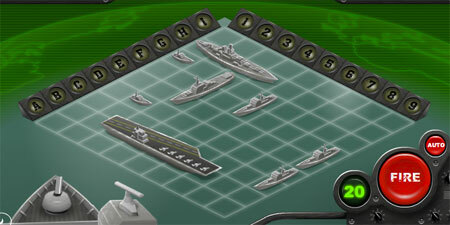 The bonus money won from sunk ships will be added to your accumulator for each game. The total payout indicates the multiplier for your initial stake at the end of the game. The amount of bonus money you get from each ship depends on the size (length in squares) of the ship. Whilst there is only the one Battleship, there are multiples of some smaller ships. As a result, there are a total of 8 ships in the game of Battle Cash Bonanza. Auto fire vs. manual fire. There are two settings for firing cannons in Battle Cash Bonanza. You can fire each individual cannonball manually. You can choose to have all 20 cannonballs fired in quick succession. Whilst the cannon oscillates back and forth, it does seem to fire cannonballs in the direction that it is pointing. So in theory, if you choose to fire manually, you can always fire in the general direction of a cluster of your ships. As a result there could be an element of skill to the game. However, in my opinion I think that the likelihood of a "hit" taking place is the same regardless of where the cannon is pointing at that time. Therefore I think that Battle Cash Bonanza is entirely luck-based. I’m sure that many will disagree with me though, so try it out for yourself and see what you think.